Four days of intense rains in Niger’s northern Air Mountains and desert towns at its base have affected 7,000 households, damaged 3,500 homes and caused widespread livestock and agriculture losses mostly in the commune of Agadez, according to local officials. Agadez commune is one of 15 communes in Agadez region. Intense rains led to a dam breaking 7km from Agadez commune, according to a preliminary government and UN assessment on 2 September. The storms damaged 400 hectares of crop land and at least seven schools in the commune. 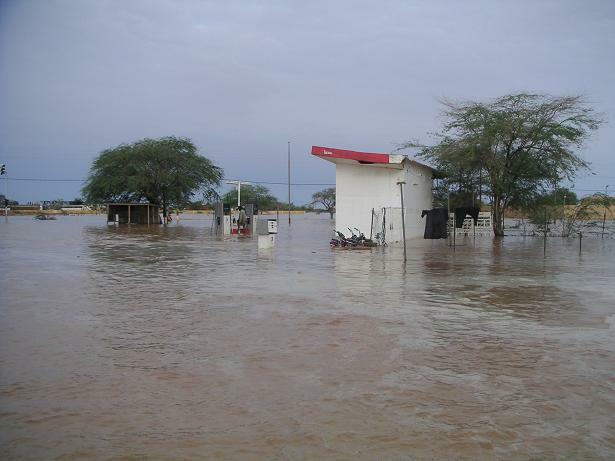 Sociologist Issouf Bayard who has specialized in Agadez told IRIN that not since pre-independence times has there been an early warning system to alert residents living near the city's various tributaries, fed from mountain rain runoff, of oncoming storms. “People do not know when there is rain in the mountains. It is only when the tributaries rise that people are caught unaware.” He said before independence in 1960, the French military sounded horns to warn people of rising water levels. The official preliminary death toll from flooding is one infant and one adult as of 2 September. In one of the most battered areas on the outskirts of Agadez commune, Azmalam, school director Moussa Ibrah told IRIN the human death toll is too low. "We [residents] are talking about dozens of deaths,” said Ibrah. He said in addition,1,200 livestock have died and all the area homes have fallen. In the neighbouring commune of Tchirozérene, more than 70 homes and one school are completely destroyed, according to the preliminary assessment. The secretary general of Agadez region and commune mayors have formed a crisis committee, which has set up 11 teams headed by village leaders to conduct house visits to assess damages. Trucks from Agadez commune are transporting flood victims to schools for temporary lodging, according to mayor Hamma. He said his office has purchased manioc flour and water to distribute to flood victims. The committee has identified dam repair, lodging flood victims and clean drinking water among its top priorities. The UN is planning in-depth evaluations in the coming days, according to UN Office for the Coordination of Humanitarian Affairs.